Film songs perhaps have been the best vehicle of conveying romance and passion in a society where on-screen permissiveness was taboo till recently. Indian cinema without songs (I didn’t say music) is perhaps unthinkable. Indians love their films with hummable songs, much to the amusement of the western audience, and this tradition (some critics consider it as a carry-over influence of the folk theatres such as “nautanki” or “jatra”) has continued ever since the advent of the talkies. Despite all criticism about the “illogical” methods of song “picturisation” in Indian cinema, the good old love song has stood the test of time. 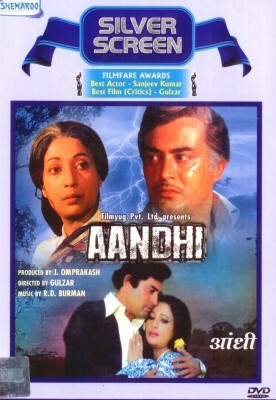 Although all films coming out of the mainstream Indian cinema have had a minimum of a couple of love songs as part of their steady average of six songs (one peppy romantic number or “prem geet” when the lovers run around trees or declare their love atop mountain peaks and one “sad song” or “virah geet” when they pine for their lost love), there have been some love songs that touch a chord every time you see or hear them. Those are the songs that keep miles away from moth-eaten formula, which portray love in all its beauty and splendour without going overboard, which are innocuously understated yet intensely passionate. For, these songs are the creations of love themselves – they are a result of the filmmaker’s passion for his craft, the lyricist’s depth of emotion poured behind every word, the composer’s intensity to weave the mood of the situation in poignant notes, and of course, the singers’ “give-my-all” rendition. Not to forget, the actors’ faith in the sincerity of the song that brings forth such convincing and true-to-life performance from them, that not for a moment do they look to be, well… “Acting”! The result? An exquisitely crafted moment of tenderness and yearning immortalised on celluloid and cherished by generations of cine lovers. In the first part of a two-part series, here is my list of five best picturised love songs in Hindi cinema – songs that linger in memory and portray love in all its different facets. The numbers do not signify ratings because frankly, these songs can’t be ranked on any scale, nor can they be compared with any other. They are just well, for lack of a better expression – “one-of-a-kind”. – Perhaps no other song has been able to capture eroticism in the way this haunting semi-classical gem from K. Asif’s Mughal-e-Azam has been able to. Anarkali (Madhubala), drawn by the irresistible notes of Tansen walks through the corridors of the royal palace to find Salim (Dilip Kumar) waiting for her. Just as she nears him, her anklets jingling in rhythm with the song, she pulls away too, shyly, a bit hesitant. As Salim caresses her impassioned face with a feather, her eyes ardent with desire look at him, and then lower, coyly as she covers her face with her veil. The camera zooms back quietly behind the tree, leaving them alone in their moment of togetherness. The shot dissolves to Salim slowly uncovering her face as the two of them share a few final moments together on a raised platform in the garden, covered with flowers that have dropped from the trees. Ustad Bade Ghulam Ali Khan’s heartfelt rendition (Mughal-e-Azam was the only foray of the great master in film songs) is used masterfully in the background and heightens the undercurrent of passion without any overt gestures. Awesome! 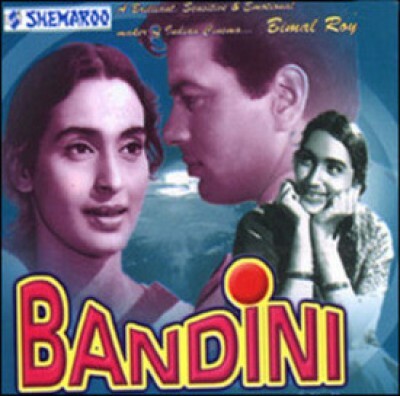 – Bimal Roy uses a folk song sung by a tea-seller in the climax of Bandini to make two estranged lovers meet in a wonderfully sensitive depiction of unrequited love finally finding fulfillment. The unassuming tea-seller making tea in his “Good Luck Tea House” by the harbour is blissfully unaware of how his ‘Bhatiali’ song (sung with immense pathos by S D Burman) that talks of how a woman is pleading to a majhi (boatman) to help her cross the river to meet her beloved, is crumbling the last shreds of grievances and doubts in Kalyani (Nutan) as she finds her lost love Shekhar (Ashok Kumar) after many years, now broken and plagued with TB. As the song reaches its crescendo, Kalyani is unable to stop herself from rushing to be with the true love of her life, turning her back on a promising future with a young doctor. Her companion desperately tries to call her back but Kalyani is unstoppable, barely managing to jump across on to the steamer as it lifts anchor. – This is a song that went on to become almost proverbial – a song with which every person who has experienced love’s many shades will identify with. Although Gulzar’s Aandhi became more known for its so-called controversies, it is a pity that it is seldom counted as one of the most mature love stories in cinema. This song is easily the high-point of the film, a song that weighs what life offered, what one gained and what one lost and perhaps all that one had gained and then lost. Used deftly in the background and interspersed with a few dialogues, the song brings forth the turmoil raging within the estranged couple Arati (Suchitra Sen) and JK (Sanjeev Kumar) who meet by chance after 9 years and yearn to recover the precious time they lost. The song begins as JK lovingly drapes his coat to help Arati beat the evening chill as they take a stroll amidst the ruins of an old palace. It moves through a few evenings of tender togetherness spent in those ruins that are reminiscent of a time gone past and lost forever. The raw intensity in JK’s eyes when he clenches his fist to contain his emotions and the quiet suffering in Arati’s eyes as she fights to hold back her tears and rests her head in silent surrender on her husband’s shoulder as Lata Mangeshkar’s lilting voice climbs the octaves with “Jee mein aata hai, tere daaman mein, sar chhupa ke hum, rotey rahe”, says volumes more than words could ever have. If you want a perfect example of expressing one’s innermost emotions without the help of words, watch Suchitra Sen and Sanjeev Kumar in this classic. – How would two newlyweds convey their longing for each other in the midst of their reception party? If the new films are to have it, they will lead their respective song and dance troupes and make a huge public spectacle of their affection. Not so with Hrishikesh Mukherjee’s Abhimaan, where all that the newlywed couple does is exchange a few loving glances and tender signs amid a crowd of people without anyone noticing, and nothing can be more intimate than those seemingly innocuous gestures. Uma hardly ever looks straight back at her husband and instantly lowers her eyes with a shy smile when he signals a kiss. The song itself is a beautiful conversation between the newlywed couple. 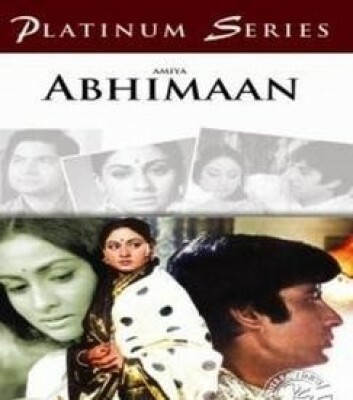 Subir (Amitabh Bachchan), the star singer, describes how each piece of Uma’s (Jaya Bhaduri) bridal finery (her bindiya, trinkets and bangles) is having a telling effect on his consciousness to his wife Uma, a small town girl catapulted overnight into the limelight. Uma responds mischievously in equal measure through the song, assuring him they will surely take his sleep away “Sajan bindiya le legi teri nindiya”. In a wonderful gesture of sobriety, befitting a newlywed Indian bride, she sits with her back to Subir, and yet the undercurrent of passion between the two is palpable. Talk of how romance can be understated yet is intensely apparent, and this song comes to mind. – This Kishore Kumar song from Shakti Samanta’s Aradhana is path-breaking in more ways than one. It is a one-take song that spools without a single cut for over five minutes, exploring a passionate one-night rendezvous between two lovers who are not married (a pioneering effort considering we were still in the conservative late 60s-early 70s). Given the fragility of the situation, it was running the risk of slipping over the edge if not handled carefully. And yet, it comes across with finesse and sensitivity, with the actors Vandana (Sharmila Tagore) and Arun (Rajesh Khanna) (one of the hottest romantic pairs of the era) setting the screen on fire literally, by their romantic exchanges on a cosy wintry night, in a room lit only by the flickering light of the fireplace. The camera tirelessly tracks the two lovers, playfully moving between light and dark areas cast around the fireplace, never for once intruding and the one shot sequence, without a single cut, builds up the magnetism to explosive levels. It reportedly took seven exhausting takes to perfect this extremely long shot and in the end, it was worth every frame.